Bernie Ecclestone has confirmed that he’s still considering a street race in Greece, despite the troubled economic state of the country. The proposed race, which would be backed by private funding and run by promoter Dielpis, has been in the planning stages for some time – as far back as 2009 – although little has been heard recently. It might be given the Mediterranean GP name, which has been trademarked by FOM. The venue is the Keratsini-Drapetsona municipality, some six miles to the west of Athens. 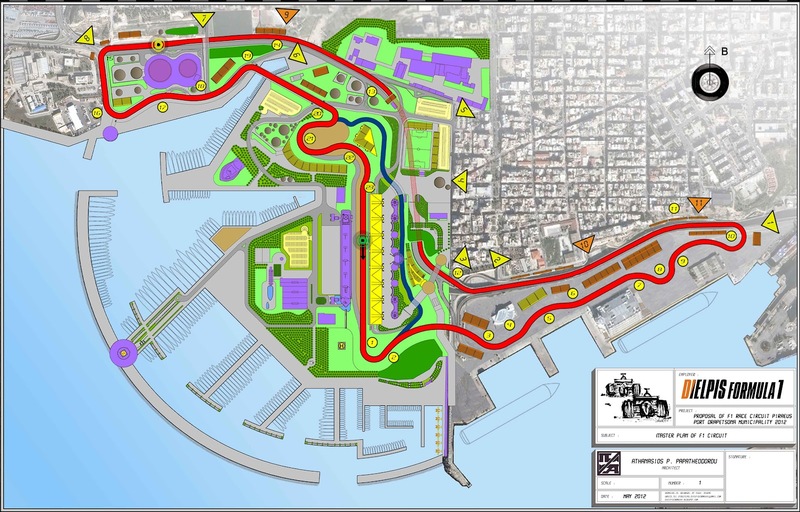 Track architect Athanasios Papatheodorou said: “The Prime Minister himself has supported fully the initiative for organising F1 races and is looking forward to the instruction from the relevant international federations to realise the Dielpis F1 project. In before some “informed” people start talking nonsense about economic situation in Greece. I’m sure Bernie loves to publicise stories about new races in order to strengthen his hand in negotiating contracts with the established circuits. Whether they ever happen or not is not important. Yet another narrow street race without passing possibilities? See monaco, Valencia, Singapore. All glitzy and glamour with no real racing. No thank you, build it in the country side if you can. “The Greeks are keen,” Ecclestone told CNN. “They want me to go and see the Prime Minister or the mayor. We will have to find out if they have got any money.”……….priceless! Please notify me when the cars actually take the grid for Q1. The section from turn 10 to turn 15 looks interesting. And they could make it a straight section from turn 3 to turn 10 and maybe provide another passing opportunity. Whether this is true or not this still concerns me. Another “proposed” street circuit. Stupid gimmicks like double points and standing restarts (if they happen) is starting make F1 look like a glorified indycar series. I would say the words “Indycar” and “glorified” don’t belong in the same sentence, even in a demeaning way! Ben, I’m going out on a limb here…..but if Bernie pulls of a race in Greece, I will give up my gambling, drinking, sinful ways and take a vow of chastity and poverty. New Jersey? The London street race? The other Russian one (if I recall the Mayor got shot) Surfers Paradise and a dozen others that have been mentioned, and never gotten off the ground. Bernie only does this to keep the genuine bids under the impression he is swamped with cities who can pay his whopping fee. I’ve seen some pretty good racing in IndyCar in the past year. I won’t watch ovals, but the road course racing has been pretty damned good. Also, not to rain on your cynicism, but both standing restarts and double points were scrapped– standing restarts before they even happened. Greece must need another defunct unsed monument. Maybe extreme forward planning, to ensure a continuing supply of ruins in for the tourists of the future. Is this how Bernie gets his money back from the Germans after his recent court case … ? If that circuit ran clockwise instead, it’d be great.